Your character gets knocked out instead of dying. You will lose your items. They can be reclaimed through a side quest. Update on the progress (2013/05/05): Hey everyone! I will definitely be working on this mod in the summer. The first things on to-do list are to add a MCM version, add more control over where you wake up, recognition of guards vs. outlaws, etc. I also have plans on incorporating afterlife & bargaining for resurrection options if I can. * Why did I create this mod? 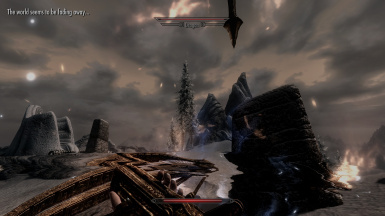 Skyrim - like most of the single player games - has a save-load feature. Unfortunately, such a system makes player death less meaningful. If you can just load a save you made a minute ago, death is not a strong enough punishment. Soon the game loses its challenge, and the suspension of disbelief is gone - how exactly did your Dragonborn manage to defeat countless enemies while suffering no defeat himself? Because of this, some people choose to play the game in "ironman", where they promise themselves not to load a previous save if their character dies. However, this has two problems: 1) It's hard to honor your commitment at times, and 2) Even vanilla Skyrim can sometimes throw monsters at you that can basically one-shot your PC in an unexpected moment. Although save-load is too easy, pure ironman might be too harsh. This mod aims to address this problem by finding a middle way. 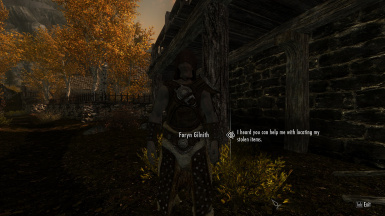 The mod will prevent your character from dying. When your character's health drops below a certain threshold, (s)he loses consciousness, and wakes up at a random location in the wilderness. When the mod is initialized, a spell called "NDM Main Menu" will be added to your spells (listed under Restoration School). 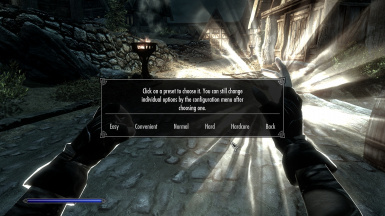 Using this spell, you can configure most aspects of the mod. 2) Immediate: You immediately know where the bandits took your items. 2) Your character wakes up in a random wilderness spot. Q: When does the mod trigger? A: When your character's health falls below an adjustable percentage of the maximum following a hit, your character faints. Your controls are frozen; your character is healed to prevent death; and the screen fades to black. Q: Does it ever fail to trigger? A: If you choose to make your character essential (available as a menu option), it always triggers. Q: What happens when my character loses consciousness? A: This is completely configurable, please see options part. 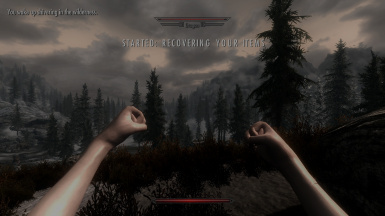 Default: All the items on your character except quest items are transferred to a hand-placed non-respawning container; and your character is moved to a location in the wilderness. The locations are not exactly random, and the one closest to your location will be chosen. Q: How can I reclaim my items? Q: Is there a chance for my items to completely disappear? A: None that I know of. All the containers are hand-placed, and set to be non-respawning. Still, I make no guarantees. Q: What happens if my character loses consciousness more than once before reclaiming what (s)he lost previously? A: The first time you lose consciousness after the mod starts (or after a reclaim); a chest is chosen from the list of hand-placed containers, and fixed. If you lose consciousness many times before reclaiming your items, all the items you lose up until you actually activate the chest will be stored in that same chest. - Recognizing a knock-out caused by guards, where you will be imprisoned rather than knocked out. (i) Becoming a prisoner/slave of outlaws or semi-intelligent enemies. Possibility to prearrange a ransom payment for your freedom. (ii) Going to afterlife after death and receiving a resurrection from the Divines or the Daedra Lords in exchange of past or future deeds. (iii) Possible integration with mods similar in spirit. Manually copy all the files in the archive to their respective places in the Skyrim\Data\ folder. Make sure you have reclaimed all your items, as the chests will be gone when you uninstall the mod. Unchecking or deleting the .esp file should be enough for an uninstall. This mod is a Work in Progress. As such, you should be aware that it might create problems. It's a good idea to keep a save file from before you start using the mod. Il Ducey, s7o, Verteiron, Michele, caleb68, Antares, and hypno88 for their helpful comments on Bethesda Skyrim forums. Feel free to alter the mod and play with the scripts for your personal use. If you plan to release your work, I would appreciate a private message.